Between 247 to 252 million years ago, Earth life was going through quite possibly its most dire time. During this period some 90% of world’s species were wiped out, but what puzzled scientists for so long is the fact that it took five million years for life to recover after this apocalypse. A new study conducted by an international team of scientists found why it took so long – it was literally too hot to survive. During what’s now commonly known as the end-Permian mass extinction, the Earth was a massive barren landscape. The die-off not only wiped out most marine and terrestrial animals, but plants too, which ensued a vicious circle. Plants absorb carbon dioxide, preventing the atmosphere from getting warmer, but as these died off in term as well, temperatures rose even higher too lethal levels. Other mass extinction periods took a few hundred thousand years for life to recover to previously similar levels, however this pre-Triassic extinction trialed life on Earth like never before – it needed five million years to surface. Earth at this time was a very peculiar world. The tropics would have a wet climate, much like today, but with no forests, only shrubs and ferns. Shellfish were the only marine creatures in the oceans. Virtually no land animals existed because their metabolisms would not have withstood such high temperatures. Only the polar regions offered a habitable refuge from the baking heat. Too darned hot to survive! 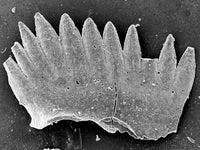 Triassic fossil of an eel-like conodont. (c) Yadong Sun. Scientists from the University of Leeds, the China University of Geosciences and the University of Erlangen-Nurnburg (Germany) analyzed fossil records of some of the few life-forms that had survived the Permian extinction – sturdier species like snails and clams. 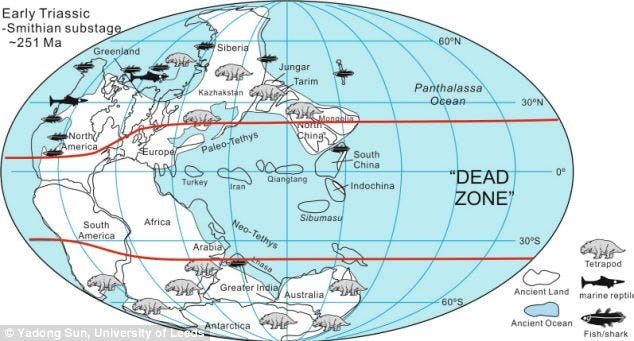 After studying the oxygen isotopes in 15,000 conodont fossils extracted from rocks in South China, which serve as ancient seawater temperature records, the researchers found that oxygen isotopes water temperatures close to the ocean’s surface could reach 40°C. “Global warming has long been linked to the end-Permian mass extinction, but this study is the first to show extreme temperatures kept life from restarting in equatorial latitudes for millions of years,” said Yadong Sun, lead author of a new study that documents the team’s findings. Until now, climate modelers have assumed sea-surface temperatures cannot surpass 30°C. The modern average for the same area is between 77 and 86 degrees Fahrenheit (25 and 30 degrees Celsius). Since 1880, global temperatures have increased by 1.4 degrees Fahrenheit (0.8 degree Celsius), two thirds of which have occurred after 1975. Despite this alarming trend, scientists assure that we’re far from witnessing a similar dire time falling upon us. Still, the pre-Permian extinction serves as a reminder of just how tough life on Earth had it, and how close it was to obliteration. “Nobody has ever dared say that past climates attained these levels of heat. Hopefully future global warming won’t get anywhere near temperatures of 250 million years ago, but if it does we have shown that it may take millions of years to recover,” noted co-researcher Paul Wignall, from the University of Leeds. Findings were presented in the journal Science.